If you’ve been to downtown Main Street lately, you have probably noticed the new burrito place being built, named Burrito California. I fancy myself as a bit of a burrito connoisseur, so I was very excited to try it out. Because of its location and 3 a.m. closing time, I tried it when most students would venture inside: After 1 a.m. A friend and I headed over on a late Saturday night, with me nearly skipping with excitement. With a simplistic menu hanging from the ceiling and the back half of the location appearing to be unused, it becomes very clear: They are very new. Unlike Chipotle, where the price is dictated by the type of meat you order, Burrito California sets the price based on what type of food you order—with tacos, burritos, nachos, and quesadillas on the menu. From a broke college student’s standpoint, I love that I’m able to get a steak burrito without having to pay more, as I usually settle for a chicken burrito because it’s cheaper. My friend ordered the chicken nachos. After we make it through the ordering process—with choices of beans, rice, lettuce, salsas, and cheese—we grab a seat at one of the few tables. I take a bite into my burrito, and the tortilla immediately stuck to the roof of my mouth, while a piece of steak seemed particularly chewy. The next few bites were mushy but tasty; however, by the halfway point, the burrito was incredibly bland. The chicken nachos were equally unappetizing, with the chicken bearing a closer resemblance to tuna than anything. The chips seemed to be too weak to carry the ingredients, breaking with every touch. Neither the nachos nor burrito looked mouthwateringly appetizing, with all ingredients appearing to be similar colors. Honestly, I was more interested in the Kahootz bartender at the next table than my burrito. With better quality chicken and perhaps additional spices, Burrito California could be a force to be reckoned with. For now, I’ll stick to eating elsewhere. Rating: Two giant flour tortillas out of five. “We been spendin’ most our lives livin’ in a pizza paradise.” That’s what Coolio would have sang if he grew up in Menomonie, a town overrun with pizza joints. As a Stout student it’s easy to forget that there are other quick and delicious off-campus dining options out there, particularly when it comes to post-bar food. However, these options are quite limited in terms of walking distance for students. Luckily, the folks at Burrito California have taken the initiative to help diversify downtown Menomonie’s dining selections. It’s common knowledge among expert burrito connoisseurs like myself that success in the burrito industry has nothing to do with restaurant décor. 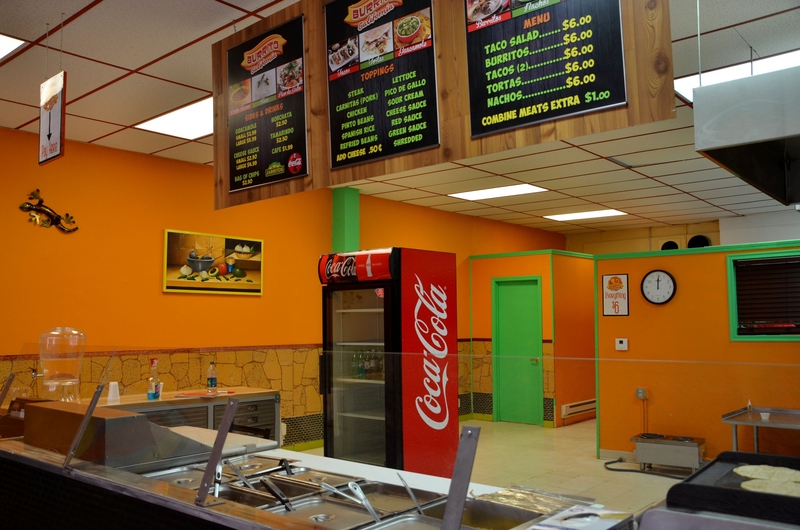 In fact, some of the most minimal-looking Mexican restaurants often serve the tastiest food. This is how I would describe Burrito California. You walk into this seemingly empty storefront to find a few sets of tables and chairs, a counter full of burrito fixings next to a cash register and a very limited kitchen area. “This definitely isn’t Chipotle,” is what you’ll probably mutter to yourself when you walk in. But guess what? Chipotle is the McDonalds of burrito places, and what you’re about to eat is delicious and authentic Mexican cuisine. After several late night research sessions I have officially decided that Burrito California is where it’s at in terms of downtown Menomonie dining. The service is great, the prices are reasonable and more importantly the food is pretty delicious, especially for a newer restaurant. As a pizza-pampered Stout student you will most likely feel skeptical going in, but I assure you that California Burrito is worth the $6 gamble. Rating: Five massive flour tortillas out of five.